SCHAUMBURG, IL (March 2018) – HEIDENHAIN’s ACU-RITE brand is again leading the way in new digital readout (DRO) products for the machine tool marketplace. Available this month, a new line of three innovative DROs with exciting new software features and robust hardware is making a difference for milling, turning, grinding and boring applications, resulting in the most complete line in the industry. ACU-RITE’s models DRO100/203/300 all support many new innovative software features, including an “Installation Guide” that appears at first-time power up that all DRO users will appreciate. The DRO100 unit has been designed as a functional yet very simple digital readout that can be easily understood by the operator. The DRO203 offers all the basic functions of the entry level DRO100 plus common features for both milling and turning applications such as, bolt-hole calculations for milling and vectoring/ taper ratio for turning. And the DRO300 high-end model provides even greater functionality. It is available in three- and four-axis variants and is programmable. The DRO300 is the only unit offering the connector for external switching functions. One completely new innovation is the option of expanding the DRO300 to serve as a six-axis digital readout. Some overall new features on these DROs include the “Dynamic Zoom”, where once activated, the display values for the axis currently being moved are maximally enlarged. The user can immediately see which axis is currently in motion. Other new software features common to all include improved file management where users can save and/or load firmware, configuration files, graphic files and instruction manuals. Also, a simpler user management system has been introduced, and up to nine users can operate the DRO203 and DRO300 units. 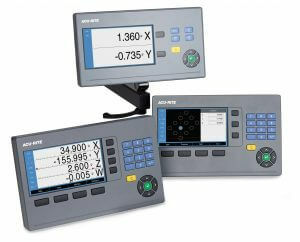 ACU-RITE is a brand of HEIDENHAIN consisting of digital readouts, linear scales and the MILLPWRG2 control. ACU-RITE DROs and control are manufactured in the U.S.